The idea of colonizing Mars has long intrigued both scientists and laymen as reflected in fiction and in non-fiction writings, in books, in magazine articles, in scientific journal articles, in movies, and in popular websites. 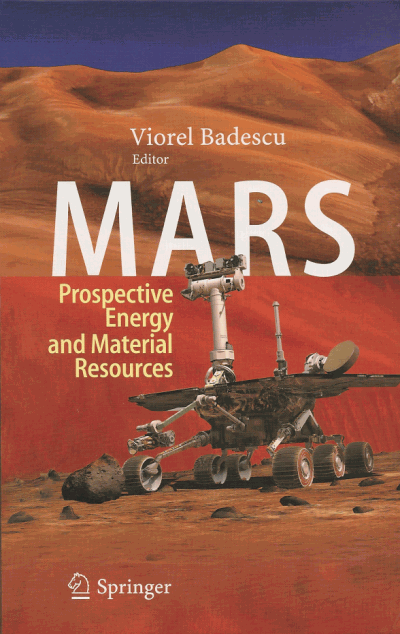 The author’s purpose in this chapter is not to review in detail the extensive, extant literature, but rather, from the perspective of a multi-disciplinary scientist with commercial mining experience, to share some thoughts pertaining to the utilization of two of the major Martian natural resources, iron and carbon dioxide, each of which has been discussed in the literature (Hepp et al. 1991; Landis 2009). Mars is the only planet in the Solar System that is potentially feasible for selfsufficient human habitation, but the environment is climatically harsh (Jakosky and Phillips 2001; Leovy 2001) and, in several important ways directly related to atmosphere, ground, and underground, quite unlike Earth (Solomon et al. 2005). In any colonization activity, survival is paramount. Although humans have a long and reasonably well documented history of colonizing new areas of Earth, those experiences will be of little benefit for Mars colonizers. Generally, in Terrestrial colonization the first priorities are to secure shelter and sources of potable water and food. The same priorities hold for Martian colonization with the additional priority of securing a source of breathable oxygen. At least for Mars, though, there is as yet no evidence of hostile denizens that people must defend themselves against. Colonized areas on Earth, even the most remote, are generally not too different from the places where the colonists originated. A notable exception is Antarctica, where virtually everything needed for survival, except air and water, must be continuously supplied and re-supplied. The great distance between Earth and Mars, varying between 57 and 400 million km, precludes major supply and re-supply. Unlike the Antarctic example, because of the great distances involved, the long transit times, and the extended human exposure to cosmic radiation in transit, a Martian colony must be largely self-sufficient. In any colonization effort anywhere, the best approach is to make the maximum use of materials at hand. The absence of trees, or in fact any vegetation, on Mars means that initial permanent shelters must be composed of rock, including rock composites, or must be constructed underground. The low tensile strength of rock without means for reinforcement places serious construction limitations on structural and building height above ground as well as depth below the ground. Iron is the most desirable material for structural reinforcement, as well as for machinery, and other uses, such as for counter weights. Fortunately, iron on Mars is known to be readily available over wide regions of the planet’s surface (Christiansen et al. 2001). In fact, iron is potentially more abundant and more readily accessible on Mars than on the surface of Earth. The nature of the technology to be employed for mining, smelting, or otherwise processing Martian iron, as well as the milling or other forms of producing useful items will depend on the chemical state of iron resources and on the relative availability of energy for processing. Ultimately, though, the technology for utilizing Martian resources will depend as well and, in fact mainly, on the timeframe for initial colonization, the monetary resources made available, and the degree and extent of beforehand planning, research, and development. In the course of past human development, the progression from Stone Age to Bronze Age to Iron Age occurred through hard-won step-by-step metallurgical understanding and related technological development, and occurred as a consequence of readily available raw materials, especially the raw materials necessary for the production of heat. At first wood from virgin forests was used, but that was replaced by the use of charcoal produced from wood by slow pyrolysis, heating in the absence of oxygen to drive off water and volatile hydrocarbons. Then coal replaced charcoal for firing iron furnaces, and then coal was ultimately replaced by coke, which is produced from coal by distilling off hydrocarbons. A very serious impediment to the utilization of Martian iron resources is the absence on Mars of plant matter, and, presumably, the complete absence of any reduced, elemental carbon that might resemble, or be able to be used in place of, coal. Nevertheless, as serious efforts are made to prepare for establishing habitable, self-sufficient colonies on Mars, preparations should be made for a new technological age, the Martian Iron Age. But at present, preparations can at best be described as sketchy or highly idealized. Far too many fundamental factors are unknown and cannot be assumed with any reasonable certainty, such as available energy and water. Moreover, there are serious logistical problems. For example, very heavy equipment is required to move sand and rock on Mars, which would be extremely costly and time consuming to bring from Earth. Further, heavy-equipment breakdowns, especially common in windy, arid places, are difficult problems on Earth, but would be of astronomical difficulty on Mars because of the remoteness. In this chapter, thoughts as to the utilization of Martian resources first address relatively near-term colonization, generally taking into account in-hand technology as much as possible. Against that framework, some thoughts are presented to suggest yet-undeveloped potential future technology. Meteorites land on Earth as well as on Mars. Some meteorites consist of nickel-iron metal combined with silicate minerals; others consist exclusively of nickel-iron metal. In ancient times, some of the iron meteorites found on Earth were directly hammered into crude hand tools (Coghlan 1941); a similar activity might take place on Mars, although with miniscule impact for colonization because of the scarcity and paucity of such deposits, and because the resulting implements would at best be quite crude, as meteoritic nickel-iron is hard but can be worked with the application of heat work from a forge like blacksmiths once commonly used. As iron meteorites crash through the atmosphere, material spalls from the surface, producing small spheres, sometimes referred to as “cosmic spherules” (Park and Reid 1965). These may be expected to comprise a small fraction of Martian sands, and can be separated magnetically either directly from Martian sand, or, more practically, from density concentrates of Martian sands obtained by using devices similar to the “dry washers” employed by precious metal miners in arid regions of Earth to separate heavy minerals from sand without using water (Rancourt 1994). As iron meteorites impact the Martian surface at high velocities, all or parts of the meteorite may melt and/or evaporate. These evaporates and melts cool quickly, condensing and solidifying, ending up either as small shards or spherules, which can be separated in the same way as “cosmic spherules” may be separated from Martian sand. Small masses of iron, typically in the size range of 1-10 mm, such as “cosmic spherules” or shards, at high temperatures undergo rapid chemical reaction with the ambient atmosphere. Depending on the prevailing oxygen fugacity at the time chemical equilibrium is frozen-in, the iron may remain metallic or it may become an iron-oxide. The nature of metallurgical processing of recovered Martian iron resources depends on the available energy, and on whether the recovered iron is combined with oxygen as the oxide (Sects. 20.3 and 20.4) or occurs as the native metal (Sects. 20.7 and 20.8). Generally, with isolated rare exceptions, ore-grade iron on Earth occurs combined with oxygen as black magnetite (Fe3O4) or as usually red-hued hematite (Fe2O3). Surface ore-grade iron on Mars is the reddish-colored iron-oxide, which gives the planet its red color and the nickname Red Planet. Indeed, hematite spherules have been observed on Mars (Squyres et al. 2004), which if present in great numbers, would be a convenient source of iron-ore for processing into iron metal. Utilization of iron for structural purposes, whether on Earth or Mars, necessarily involves reducing the ore to the metal by chemical means and then processing and fabricating into useful forms. Mars appears to have similar surface ore-grade iron oxide compounds as Earth and in relatively greater abundance. However, Mars is essentially devoid of elemental carbon. Consequently, iron metal production on Mars will require greater energy expenditure. Although Mars is virtually devoid of elemental carbon, the main constituent of the Martian atmosphere is carbon dioxide (CO2) which can be utilized for processing iron. Fig. 20.1 The pressure independent equilibrium ratio of the pressure of carbon monoxide to the pressure of carbon dioxide as a function of temperature for the reaction 3 CO + Fe2O3 = 2 Fe + 3 CO2. 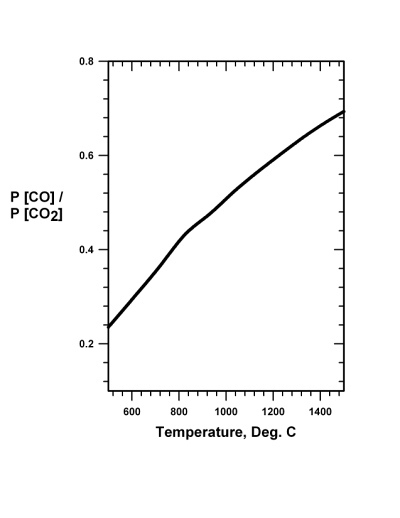 Prompt removal of carbon dioxide drives the reaction to the right. Reaction Eq. (20.2) requires a temperature of about 1100°C. Note that the iron reduction reaction Eq. (20.1) can take place at about 700°C, but a higher temperature, such as 900°C, would be desirable. As Mars is truly remote and accessible only at great expenditure of time, energy and perhaps human lives, it would seem that the simplicity of the above approach would be a great advantage. The technological shortcoming of the approach, however, is that a simple, rugged, and foolproof method of separating carbon monoxide and oxygen would need to be developed to work efficiently and successfully in that distant place. And, of course, there is a serious energy requirement to attain operating temperatures. In addition, extreme degradation of equipment occurs at those operating temperatures, necessitating frequent replacement. Pure iron melts at 1535°C. Thus the reduced iron produced by reduction with carbon monoxide will not alone lead to the separation of iron from impurities. Consequently, the iron obtained through reaction Eq. (20.1) would necessarily need additional processing, such as described in Sects. 20.6 and 20.7.
or by the reaction of carbon monoxide and water gas (H2O), i.e. The source of carbon monoxide for reaction Eq. (20.5) would come from reaction Eq. (20.2). In any remotely located technical activity, simplicity is truly the key to eventual success. It is known from experience that reaction Eq. (20.3) requires for efficiency a minimum temperature of about 700°C, although 900°C is probably more practical from the standpoint of reaction rate and reaction completion. Recall that pure iron melts at 1535°C. Thus the reduced iron produced by reduction with hydrogen, like the reduced iron produced by reduction with carbon monoxide, by reaction Eq. (20.1), will not alone lead to the separation of iron from impurities. Consequently, the iron obtained either through reaction Eq. (20.3) or reaction Eq. (20.1) would necessarily need additional processing, such as described in Sects. 20.5, 20.6 and 20.7. Fig. 20.2 The pressure independent equilibrium ratio of the pressure of hydrogen to the pressure of water gas as a function of temperature for the reaction 3 H2 + Fe2O3 = 2 Fe + 3 H2O. Prompt removal of gaseous water drives the reaction to the right. Most of the iron metal produced on Earth is reduced from the oxide and smelted in the same step. Recall that Terrestrial iron-oxide is reduced to the metal mainly by heating with elemental carbon. Limestone is added, which decomposes to yield calcium oxide (CaO), which then combines with silica (SiO2) to form slag (CaSiO3). The slag serves to scavenge impurities and to shield the surface of the molten iron from reaction with atmospheric oxygen. Heat produced by the reaction of carbon with oxygen helps to bring the temperature to above the melting point of iron. Iron, being denser than the slag, settles by the action of gravity. The advantage of this process is that the end-point iron is molten, into which additional alloying elements can easily be added to improve physical properties, and the iron produced can be directly processed into structural units, such as I-beams. The virtual absence of elemental carbon on Mars precludes Earth-like iron smelting, although a variant might be undertaken. Martian iron produced by either reaction Eq. (20.1) of reaction Eq. (20.3) could in principle be smelted, using an electric furnace, provided slag-forming minerals are available to be mined and provided that sufficient energy sources are available to power the operation, which cannot depend upon energy produced by the oxidation of carbon. Aside from high energy demands, the high temperatures involved can pose serious technological problems, especially during the initial periods of Mars colonization. On Mars there would be great advantages to be gained from being able to avoid temperatures near the melting point of iron (1535°C). Sintering is one mechanism of treating the iron produced from reactions Eqs. (20.1) and (20.3) to produce specific shapes and simultaneously impart improved physical properties. Sintering involves the application of heat and pressure to iron powder produced by either reaction Eq. (20.1) or reaction Eq. (20.3), or more ideally from the processes described in Sects. 20.7 and 20.8. The temperatures involved would be below the melting point of iron, possibly as low as 900°C. A protective or reducing atmosphere during processing is necessary to keep the iron from oxidizing. If the iron-oxide being reduced via reaction Eq. (20.1) or reaction Eq. (20.3) is quite pure, sintering could be accomplished in the same reduction chamber, if piston-fitted for subsequent compression. If the reduced iron contains too many impurities, such as silica, after reduction the charge could be disrupted by tumbling, and jigged to separate the iron from the gangue before sintering. At 1 bar pressure, iron pentacarbonyl is yellowish-brown, readily volatile, liquid which becomes a gas at temperatures above 103°C. At present, iron carbonyl has commercial applications as a catalyst for organic chemical reactions and as a battlefield obscurant. A classic laboratory demonstration of the thermal decomposition of iron pentacarbonyl involves passing vapors of the compound, carried along by an inert carrier gas such as nitrogen, through a glass tube to which, when heat is applied (ca. 170°C), causes iron to be deposited on the hot inner walls of the glass tube. The metallic iron deposition is notable because it happens quickly at a low temperature and because it produces a mirror-like reflective surface. 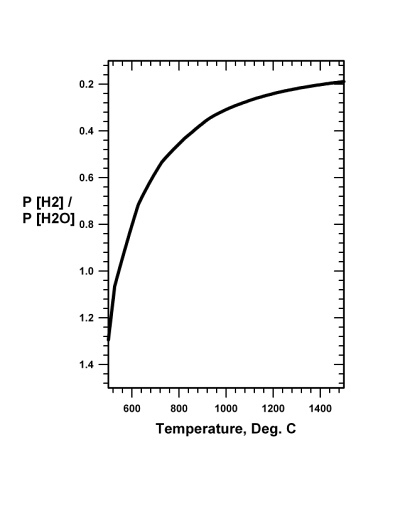 Thermal decomposition of iron pentacarbonyl is the means by which iron-product fabrication might be achieved on Mars (Jenkin 1990). The starting point for producing iron pentacarbonyl is iron metal, not iron oxide. The iron metal produced by either reaction Eq. (20.1) or reaction Eq. (20.3) would be appropriate for producing iron pentacarbonyl, provided oxidizers, such as H2O are first purged. Because iron pentacarbonyl is liquid, with a relatively high vapor pressure, and because it readily decomposes on surfaces with temperatures as low as 170°C, it would seem to be the ideal medium for fabricating iron structures on Mars. Because of the relatively low temperatures involved, material handling and fabrication techniques can be extensively developed on Earth. Iron pentacarbonyl should not be exposed to air or sunlight and can be stored under water. Interestingly, the Fe(CO)5 molecule is unstable with respect to sheer stresses; the author once destroyed an expensive piston vacuum pump by admitting iron pentacarbonyl vapor into the vacuum cylinder. A note of caution: Iron pentacarbonyl is toxic, causing lung irritation, toxic pneumonitis, and pulmonary edema. At ambient pressure, nickel carbonyl is a gas at temperatures above 40°C. The author is unaware of any experimental, simultaneous production of iron pentacarbonyl and nickel carbonyl from meteoritic metal, or what potential difficulties or benefits might be encountered. As nickel carbonyl is considerably more volatile than iron carbonyl, separation of the two, in principle at least, should pose no difficulty. Another note of caution: Nickel carbonyl is considerably more toxic than iron pentacarbonyl. (2) Can meteoritic nickel-iron metal efficiently be converted into iron carbonyl and nickel carbonyl? The answer to (2) can be obtained on Earth from laboratory studies, but the answer to (1) is not known. If the answers to (1) and (2) were both “yes’, then, to this author, the preferred approach for processing Martian iron would be to use meteoritic nickel-iron metal in reactions Eqs. (20.6) and (20.7) simultaneously. After separating the iron carbonyl and nickel carbonyl, these could be thermally decomposed either to plate surfaces or to produce metal powders for sintering. If, on the other hand, meteoritic nickel-iron metal resources were insufficient, or if some insurmountable problem were found that would render impossible the production of carbonyl compounds from meteoritic nickel-iron metal, then it seems to the author that the best approach for utilizing Martian iron and carbon dioxide resources is through reactions Eqs. (20.1), (20.2), and (20.6). In other words, from atmospheric carbon dioxide, through reaction Eq. (20.2), produce oxygen for breathing and carbon monoxide for iron-making. Reduce iron oxide with carbon monoxide through reaction Eq. (20.1) to produce iron metal. Use that iron metal with carbon monoxide to produce iron pentacarbonyl through reaction Eq. (20.6). Then, make use of the thermal decomposition of iron pentacarbonyl vapor to produce iron metal objects or to produce iron powder for sintering. One major technological shortcoming of the approach, however, is that a simple, rugged, and foolproof method of separating carbon monoxide and oxygen would need to be developed to work efficiently and successfully in the great remoteness and inaccessibility of the Martian Surface. The other major shortcoming relates to energy availability. One of the greatest uncertainties in planning for Martian iron production is theuncertainty surrounding the availability of appropriate energy sources. Nuclear energy sources, based upon the heat of natural radioactive decay, might be sufficient for powering scientific instruments, but not for processing iron, even on a relatively modest scale. Utilizing solar energy for that purpose is even more impractical than it would be on Earth, due to the lower intensity of incident sunlight and because of the technological difficulties posed by Martian sandstorms. Similarly, utilizing wind energy for iron production is impractical due to the low atmospheric pressure on Mars. It is not known whether the Martian equivalent of geothermal energy might be available, but from Terrestrial experience it would seem at best to be insufficient. To this author, one known way of obtaining the power required for driving a Martian Iron Age would be if fully functional and fueled nuclear fission reactors are brought from Earth. But, because as yet there is no evidence of uranium ore deposits on Mars, self-sufficiency would be an impossible; Mars colonies would require continuing and expensive re-supply from Earth. There are, however, other solutions, described in Chaps. 7, 9 and 10. The Internet hosts a variety of websites and blogs devoted to Mars and, especially, to dreams of Martian colonization. And, while it is human nature to “dream the impossible dream”, it is of benefit to pause and reflect a bit on what might be gained and the price to be paid. Robotic exploration of Mars is not only doable, but it is an on-going, reasonably successful, endeavor. So, one might ask, why and under what circumstances would planning for the establishment of a permanent, self-sufficient colony on Mars be justified? Some might argue that priorities at home should come first. What justification can be made to plan for Martian colonization while there is homelessness, hunger, and disease here on Earth? Recall that Mars is the only planet in the Solar System that is potentially feasible for self-sufficient human habitation. If Earth were to face impending doom, from plague, nuclear holocaust, asteroid impact, or as the result of some other catastrophic natural or man-made disaster, Mars may be the only location where members of the human species might be able to survive. The prospect of impending humanity-doom may be remote, a very low-probability event, but an event with non-zero probability. From the standpoint of human survival, one-way transport to Mars may be the only possibility. In other words, a Martian colony would of necessity need to be entirely self-sufficient, totally without the possibility for re-supply. Planning therefore should be focused upon non-re-supply, which has profound implications with respect to the utilization of Martian iron and carbon dioxide resources. Producing carbonyl from meteoritic nickel-iron metal appears, from energy requirements, to be the only potentially feasible mechanism for making iron and nickel metal on Mars without re-supply from Earth. Although the amount of available meteoritic nickel-iron metal on the Martian surface is unknown, iron meteorites are known to exist there (Landis 2009). Laboratory experiments to produce iron carbonyl and nickel carbonyl from meteoritic nickel-iron metal are not expensive to make. In fact, only one scientist with modest equipment is required. So, from the standpoint of Mars’ colonization, this is where emphasis should be placed for the production on Mars of iron and nickel metal. But there is a conflict in that concept, a paradox. In general, it would seem that any self-sufficient colonization on Mars, based upon iron reinforcements and iron structural members, will require substantial quantities of high tensile strength, high-carbon iron-alloys not only for construction, but for farming, mining, transportation, and manufacturing. The structural strength of steel arises from the exsolution of iron carbide (Fe3C) lamellae, called pearlite. But to add carbon to iron to produce high tensile strength steel is a high temperature, high energy-consuming process. The high energy requirements of Martian steel production are inescapable. From the long-term prospect of establishing a fully self-sufficient, non-re-supply, colony, the author suggests considering bamboo as an alternative to iron metal as structural reinforcement for construction materials (Ghavami 1995). Of course, that would mean “engineering” a species of bamboo that could grow well first in Martian greenhouses, and, perhaps later, outside in the Martian environment. Such a prospect is really not as extreme as it may seem at first. If humanity is to be able to exist in wholly self-sufficient colonies without the possibility for re-supply from Earth, Mars-adapted plants would be an absolute necessity. In addition to providing food and structural reinforcement material, plants, as is well known, utilize carbon dioxide and give back in return breathable oxygen. While the need for establishing self-sufficient Martian colonies to save humanity may never arise, preparation, especially development of Mars-adapted botanicals, may have the fringe benefit of helping humans to create new plant species to utilize excess carbon dioxide on Earth and to make up for reduced oxygen production that has resulted from denuding our forests and reducing the phytoplankton content of our oceans.